Now for part two of my Christmas gift buying guide for those special people you like to spend a little extra on. 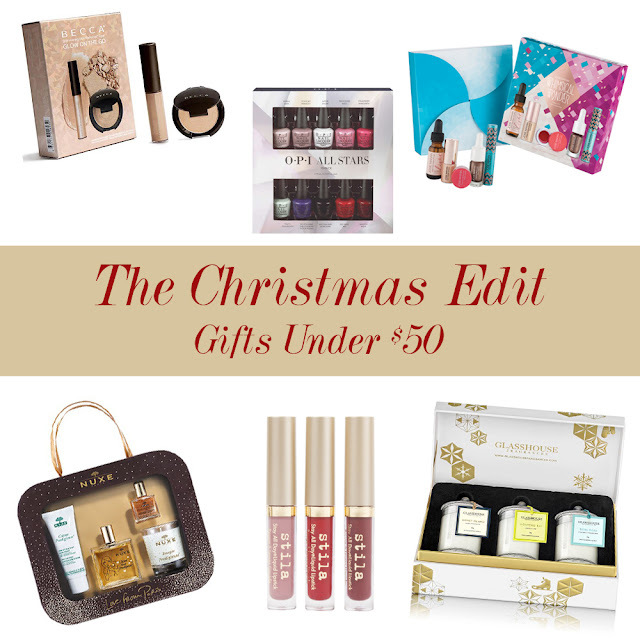 All of these gifts are under $50 and I think every beauty junkie like myself would be more than happy to receive them underneath the tree this year. First of all, this set is $5 cheaper at Adore Beauty than Sephora and they do free shipping on all orders and they give you a free Tim Tam with every pack so definitely order from them. As someone who is head over heals in love with Becca highlighters, this pack would be an absolutely stunning gift. Granted they are quite small sizes that don't give you amazing value for money but highlighter is really one of those products where you would be hard pressed to use a whole pan in a lifetime so it is an okay payoff considering you get to try the pressed and liquid form for significantly less than even one full sized product. I love OPI mini packs because for the price of two and a bit full sized bottles you get to try ten beautiful shades. Lets be honest, who even uses a whole bottle of nail polish anyway? My collection is so out of control that I would be lucky to use even my favourite shades more than 15 times. OPI is an amazing formula and they are really good quality. They also come in really nice colours that generally apply a lot more smoothly and opaque than cheaper polishes. If you know someone that loves to treat themselves to a DIY mani-pedi this would be a beautiful gift. When I saw this I was really blown away by the value and how many deluxe samples you get. Because I am insane, I actually went through and calcuated the product value which comes to over $100 if my maths is correct (it could go either way). That is amazing value before you even factor in the fact that you get to try 5 different high end products for less than $50. I personally want this one bad so I am sure any other beauty lover would as well. I love Nuxe products and their Dry Oil is particular stand out. It even smells so insanely good that they have created a candle in the same scent! It is also important to not just how great the value is on this pack considering the Crème Prodigieuse cream costs $44.95 just on its own. That means you get a discount on that great product and another full sized dry oil valued at $24.95, an exclusive candle and a deluxe sample of the golden shimmer dry oil. It really is one of the best value packs there is and the products are so unbelievably gorgeous. Nuxe is probably my favourite skincare brand period so this is definitely a great gift option for anyone who enjoys some luxe skincare. These liquid lipsticks are quickly gaining cult favourite status and this gorgeous little pack gives you the opportunity to try out three generous samples for less than the price of one full sized tube. I also love that there is a good breadth of colour choices in this small pack. You have a gorgeous light pink, a classic red and vampy purple. They are great classic staple colours and it is really a well thought out little pack. Each of these little candles are valued at $18.95 so not only do you get $56.85 worth of product but it is all beautifully presented in a lovely gift box. The pack includes the scents Coney Island (burnt sugar & fig), Montego Bay (coconut lime) and Bora Bora (cilantro & orange zest). I already have Coney Island and it is beautiful! Glasshouse Fragrance candles are some of the prettiest looking and smelling candles you can buy without spending huge amounts of money so they really do make the perfect gift. So there you have my picks for gifts under $50. I would happily received each and every one of these and there are few I may yet even buy for myself. Which ones will you buy buying at gifts for loved ones or maybe even for yourself? Let me know below in the comments.